Our Training and Research coordinator Inés shares some more details on the 4D community and why we are working hard to create a network of immersive practitioners. 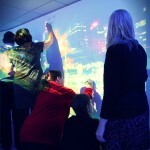 If you’re working in an immersive space, we’d love for you to be involved. Full details are below or you can get in touch with the 4D team here. Immersive environments, by definition, are spaces that take people outside of their everyday experiences to immerse them in the creation of new worlds and perspectives. While this is what makes them so powerful, it also means that sometimes sharing or retelling an immersive experience outside of the space can be hard to do under the glare of the staffroom’s strip lighting. As a team that all have direct experience of the education and healthcare sectors, we are aware of the many daily priorities, responsibilities and challenges that staff have to juggle. Time pressures, low resources, and limited time to get together as a team mean that sharing best practice can be difficult. However, since we launched in 2009 we’ve seen and heard so many incredible examples of use – from using the tunnel theme to develop vowel sounds in KS3 French to integrating props with a Hansel & Gretel timeline to take young people on a journey of texture – that we knew we wanted to do something to encourage sharing of practice right across the network. This meant engaging people from our 4D champions to less confident users still exploring how to get the most out of their space. So, where to begin? During a masters degree, I wrote a postgrad university essay on ‘Interpreting arts participant groups as Communities of Practice’. I had heard the phrase ‘Communities of Practice’ banded about, but to me it seemed bizarre to create a separate group and strategy for learning when learning was exactly what these arts participation sessions were about. If we are using creative means to enhance learning and collaboration for the participants, doesn’t this suggest that we could be using creativity for our own learning too? Etienne Wenger, educational theorist and one of the most respected voices at the Communities of Practice (CoP) school, said that “learning can be the reason the community comes together or an incidental outcome of members’ interactions”. That is to say, a group may be performing as a CoP without necessarily being aware of it, whether they are catching up about a pupil’s response to a trip to the moon over lunch, or uploading a short video of their latest immersive session in the spooky forest to YouTube. So, we were faced with a task – how can we help this informal learning across schools extend to a larger network, so more people can give and take inspiration from it, without it becoming a burden for our busy practitioners? For us, the answer had to lie somewhere in the field of creativity. We already know the teachers we work with are highly creative, and if creativity can be used as a teaching tool that gives more ownership to pupils, then it can also be used as a way to strengthen and develop a sense of community and sharing across practitioners or, as our friend Wenger puts it, “[create] an environment in which the value communities bring is acknowledged”. We knew this sharing needed to be fun, lightweight and inspiring. Crucially, we also knew it had to be led not by us but by the expertise of the practitioners on the ground. From this need we developed a series of regional inter-school creative network sessions called 4D exchange. 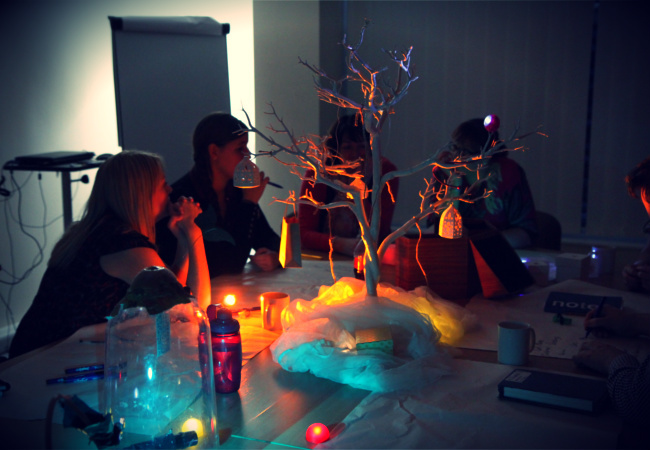 4D exchange is a regular event where teachers working in 4D immersive spaces can exchange ideas, best practice and resources with each other, in an immersive environment. Presenters each have 5 minutes to share an overview of an idea, lesson or resource they have found particularly effective in their space. How they present this is up to them – some may take us on a mini immersive journey through their created timeline, others may bring along the props they used, whilst others will share samples of the resulting works that pupils created. We ask for very little in advance – just a brief sentence around your topic and any content you’d like us to upload, so that impact on capacity is minimum. The sessions last 90 minutes, with a break included, but you could easily replicate something on a smaller scale during your weekly staff meetings. After the presentation there is plenty of room for discussion and hands-on experimenting in the space, followed by a chance to see new content in development, and hear some short tips and tricks from the 4D creative team. 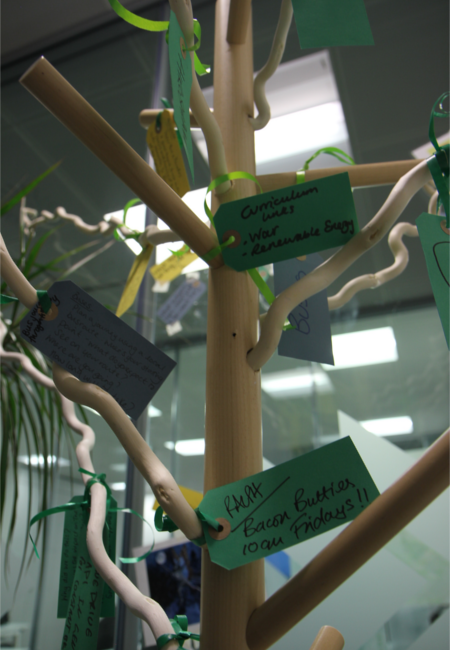 The sessions also allow us to gather feedback from our spaces to see how we can support them in the future. And, of course, biscuits are provided! We’ve found these sessions to be fun and informative and, crucially, the practitioners who attended have left inspired and full of ideas! 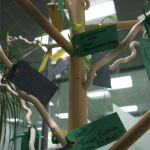 As our community develops, we’re learning more and more about what you need to help you develop as a 4D practitioner. 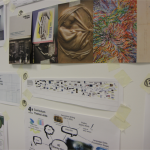 From cloud-based content sharing to teacher exchanges, we’re always keen to develop new resources and approaches to help the creative exchange of ideas. 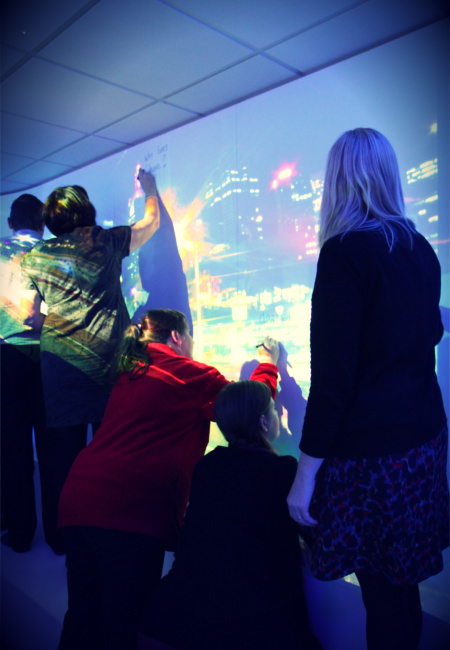 How do you share best practice about immersive learning across your school? Do you have any feedback or good news stories you’d like to share with us? Or would you be interested in setting up your own 4D exchange hub? If so, we’d love to hear from you! Get in touch at ines@4dcreative.co.uk or 0844 414 2595. Welcome to the 4D community! Our next 4D exchange is taking place on the 25th March at Kensington Community Primary School in Liverpool. —. “Communities of Practice. Learning as a Social System.” The Systems Thinker. June/July 1998. Web. Soria-Donlan, Inés. Interpreting participant groups as Communities of Practice: Changing the way we look at arts participation. 2012. Web. Our collaboration with the Sat‘dy Allsorts at Z-arts in Manchester came to a close recently. We had a fantastic time working with the young people as they became content developers learning how to create their own immersive experiences. Read the first part of this journey here. The content which the young people at Sat’dy Allsorts created was excellent, they’d really embraced the brief and had researched images online using filtered searches to find Creative Commons licensed photos and worked in groups to create some instrumental music to go with them. As the ‘IMMERSE’ project came to a close, we went back to the centre to see and hear the finished results and to show the parents what the young people had achieved. Our portable immersive space, ‘4D Pop Up’ was set up and guests gathered inside as each group introduced their work and gave some information on how they had created the new immersive themes. There was a huge range of themes such as Underwater, Shakespeare, Electricity, Alliteration, Poverty, and Urban life that it made for a really varied event to share with the parents and public Some groups chose to perform their pieces of music live alongside the images and videos they had created whilst other groups had produced and recorded their tracks to play through the 4D Pop Up built in sound system. 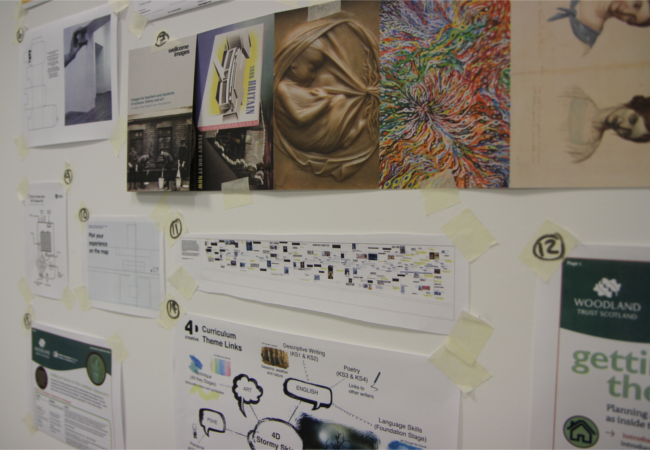 All of the music that was created was of such a high quality it would fit into any 4D space and the images that were used in each theme really helped to tell a story – we could easily see how teachers could potentially base a lesson around the themes that were created. The whole project has been a huge success and 4D creative have thoroughly enjoyed working with all the young people on the project over the 8 weeks. Massive thanks must go to Tosin and Saskia at Z-arts and all the young people for working with us to create a really valuable experience for the young musicians and content developers. Join our team! 4D are hiring! As 4D continues to grow, we’re looking to expand our team…. Fancy building the rainforest on Monday and outer space by Tuesday? Want to create new worlds to inspire young people? We are looking for a highly organised and technically proficient Multimedia Content Technician to join our busy team in MediaCityUK. You will be responsible for sourcing, managing, editing and developing engaging multimedia-based learning content for our immersive environments. Using your expertise in the Adobe Creative Suite and other similar applications you will produce digital resources including soundscapes, large scale videos, photographs and interactive experiences for young people and adults of all abilities. Working alongside our development team you will ensure our content looks great on all of our systems and maintain our content webshop. The role will also include plenty of opportunity to work with our marketing department to produce short promotional videos for our website. You must have a minimum of 1 years professional experience in a relevant industry. Based at MediaCityUK, Salford – starting ASAP. 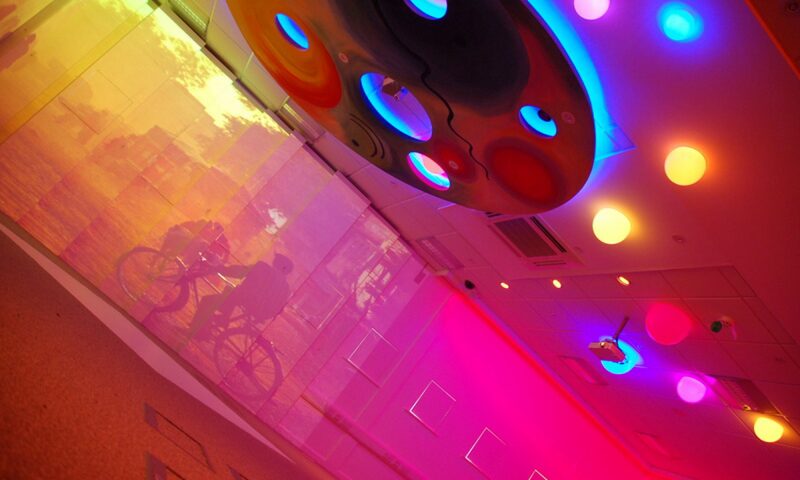 Installed 8 permanent immersive spaces including our first in a healthcare setting. And our diary is already filling up for the coming months. The photo above is from the superb new hall space at Worsbrough Common Primary School in Barnsley. Developed the 4D Pop Up and the first orders are already coming in. The first Pop Ups will be delivered in July. 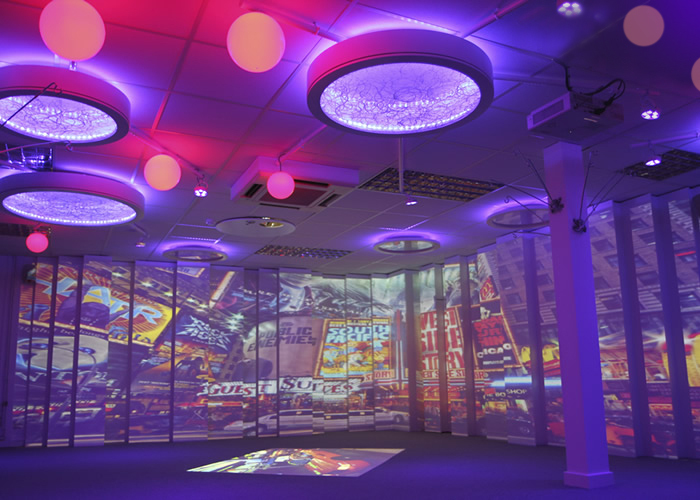 Get in touch to find out more about our portable immersive spaces. Moved offices to our fantastic new space at the heart of MediaCityUK. Come and see us at our base, we have a full immersive space, the 4D Pop Up to see and we’ll buy you lunch! Expanded our team including new content creators, .Net developers and more. We’ve already moved into extra space in our new offices as the team has grown so much. Flattering photos of the new staff will be on the website soon! Whilst schools take a well earned break over the summer, our installations team get even busier with July and August looking packed already. 4D Pop Up will be going on tour around the country soon. There will be lots of chances to explore and experience this new space – we’re so excited to show you. Our software is going from strength to strength with a new tablet version soon and the launch of our online resource centre – download new immersive content direct to your system! As ever, we’d love to hear from you. Get in touch or find us at Twitter and Facebook. World Book Day 2013 – What we’re reading! As it’s World Book Day today we thought we’d share with you what the 4D Team are currently reading. Storytelling goes to the heart of what we do at 4D and the immersive spaces we create are ideal for setting the scene for a creative writing session. 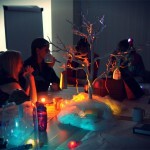 I’m sure lots of our immersive spaces are being used for exciting storytelling sessions today! My son Riley got given the Roald Dahl box set for Christmas so we’ve been working our way through all the classics. Riley loves Matilda and thinks it’s hilarious. Bruce Bogtrotter eating the giant cake has been his favourite bit so far. He fell asleep as I was reading to him the other night, I was enjoying myself so much I carried on reading without him! I am reading Beyond a Joke as it feeds into my second love outside of work, comedy. Third if you include family of course. Watching it, reading about it, seeing comedy live, all these pursuits offer a great distraction from reality. This book examines the image of all comedians as being damaged and flawed in some way. I have met a few along the way with my other distraction, The Funny Looking Podcast and they have all come across as rather sweet and ordinary people. I’ve just finished All The Pretty Horses and loved it so am on the lookout for a new one! Set in post-war America, All the Pretty Horses follows two teenage cowboys, John Grady Cole and Lacey Rawlins, who ride south into Mexico in search of new adventures. They meet a young and somewhat odd boy called Jimmy Blevins along the way, who turns their journey into something much darker than they could ever have expected. It’s slow, atmospheric and beautifully written, and McCarthy’s simple yet stunning descriptions of the Wild West’s sounds, light, and spaces make you feel like you’re right in the middle of it all – a bit like a 4D space I suppose! Granted, it’s a bit of an oldey, but the perfect book to delve into when it’s horrible and grey outside! Inverting The Pyramid is a discussion on the history of football tactics and makes me feel like a massive loser every time I read it on the tram! Football is something I’ve loved for as long as I remember and over the last couple of years I’ve really enjoyed finding out more of the history of the game. Inverting the Pyramid takes you right back to the start, explains how football developed and then how different people have interpreted the game. Thankfully the writing is excellent and there’s lots of fascinating characters explained in great detail to keep the book from becoming a total bore. It also fuels me for post match discussion in the pub! If you’re a proper football geek like me you should also check out The Blizzard which is a quarterly magazine come book that is full of great articles from the world of soccer. The Flying Scotsman is the autobiography of the twice cycling world hour record holder Graeme Obree. He’s a pretty inspiring guy. He basically turned the cycling world on it’s head when a relatively unknown rider from Scotland broke the world record on a bike he built in his kitchen, using parts from a washing machine! Not going to lie, it’s a brutally honest and bleak account on the dedication and lengths you have to goto to be a world beating sportsman. There’s a really cool documentary on Youtube about his rivalry with Chris Boardman in the early 90’s here. Graeme’s currently working towards beating the World Human Powered Land Speed record at 47 years of age. Of course it’s on an unusually designed prone bike he’s building out of among other things pots & pans! You can follow his progress here.